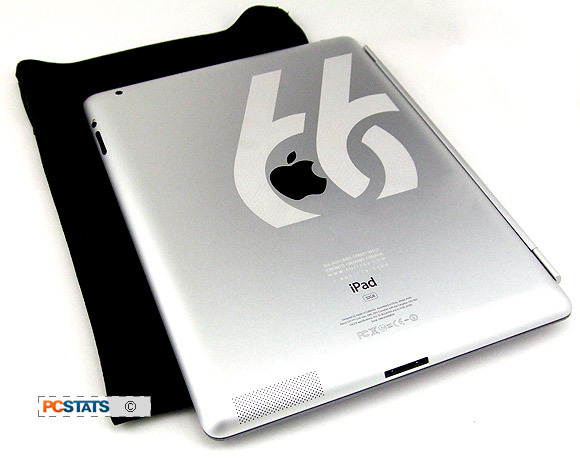 Abstract: This is a quick look at a simple, exceptionally thin and unobtrusive sleeve case we here at PCSTATS recently bought for the Apple iPad2 with Smart Cover. 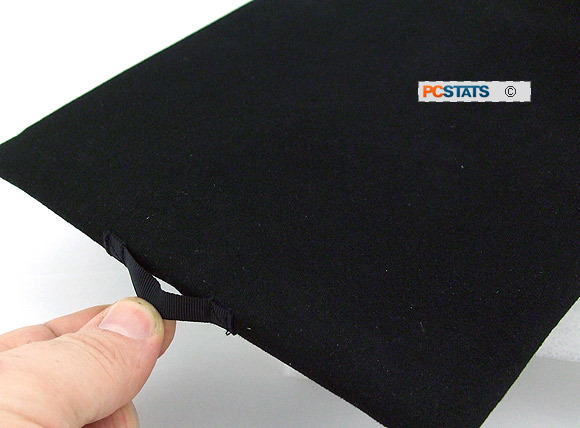 This is a quick look at a simple, exceptionally thin and unobtrusive sleeve case we here at PCSTATS recently bought for the Apple iPad2 with Smart Cover. Now before I came across the Waterfield iPad Suede Jacket Sleeve Case that's the subject of this review, a couple good hours were devoted to browsing page after page of after market Apple iPad sleeve cases - there's a lot of them out there. Rather annoyingly, most of these cases were too bulky or thick for our needs, too silicon-rubbery, badly designed or as ugly as a recycled scuba suit. Isn't this always the case when you need the technological equivalent of "the little black dress" for your high tech gear? Anyway, we required something soft, thin and preferably black to protect an Apple iPad2 which had been laser engraved from scuff marks. 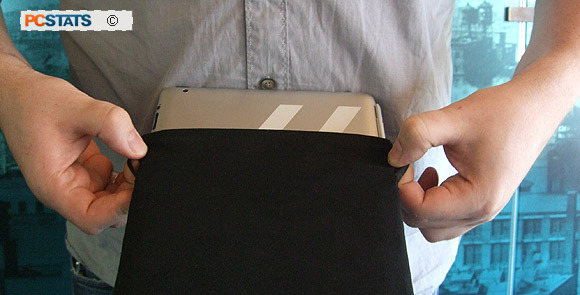 Since the iPad2 would be travelling around in a computer bag with everything else, padding wasn't a requirement but thinness was. Enter the Waterfield iPad Suede Jacket; a slim sleeve case made by SFBags out of San Francisco from the synthetic material Ultrasuede. The Suede Jacket comes in a couple variations, each designed to fit the original Apple iPad, iPad2 or iPad2 with Smart Cover. An optional outside pocket can be tacked on, but this didn't fit our needs. Waterfield's iPad Suede Jacket is essentially one 10" x 7.5" x 0.5" pocket made from a single piece of the slightly elastic Ultrasuede material. 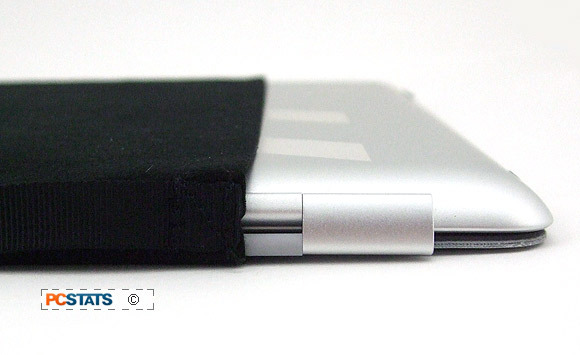 Three 1.5" x 3/8" flush pull tabs are sewn to the edges of this pocket to aid insertion and removal of the iPad2 device. Two tabs are located on either side of the sleeve opening at the top, one pull tab at the bottom center for removal. One of the side tabs (there are two) to help slip the sleeve cover on an iPad2. 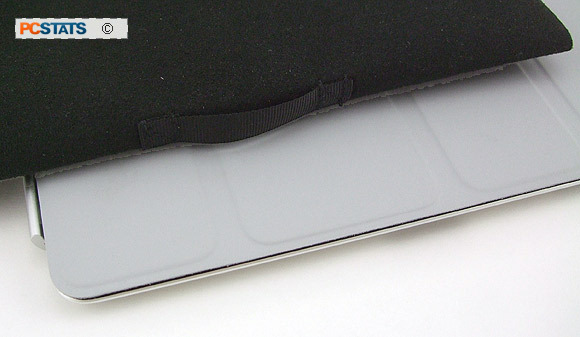 The bottom tab to help remove the iPad2 from the Suede Jacket sleeve case. 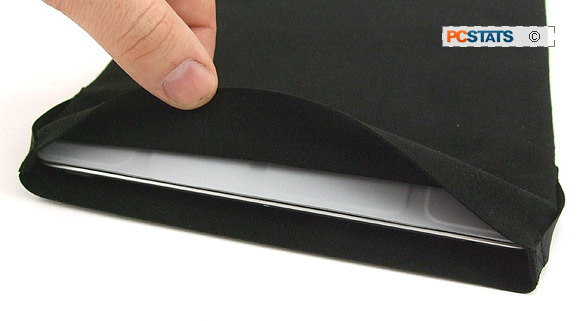 The black Ultrasuede material feels like the material used on the underside of the Apple iPad Smart Cover and can even be used to clean fingerprints off the screen. It's a soft material, but it's not padded. The Waterfield Suede Jacket slips over the hinges of the Apple Smart Cover and fits snugly so there's no chance of the iPad from sliding out if accidentally held upside down. Without the Smart Cover installed, this particular sleeve is roomy enough that the iPad will slide free of the sleeve, so be mindful of this if you remove the Smart Cover and slip the iPad into the Waterfield Suede Jacket sleeve. Waterfield offer another model made more snugly for bare iPad / iPad2's. To use the Waterfield Suede Jacket, slip the sleeve case over the bottom of the iPad2 about 1/3rd of the way up, then re-positioning the iPad2 against your stomach and using both hands, grip the pull tabs on either side of the opening and pull the sleeve all the way up. When fully in, the sleeve is about a 1/2" taller than the iPad2. Grip from both sides and pull the cover back to slip the iPad in. To free the iPad2 from the Suede Jacket, grip the bottom pull tab and the top of the iPad2, then pull apart. The Suede Jacket pulls free with just enough resistance that you don't have to worry about the case coming off unintentionally. Because these sleeve cases fit like a glove, the key is to choose the right case for the model of iPad, or iPad2 + Smart Cover you own. The Ultrasuade material isn't an elastic mesh, but it will stretch a little beyond its at rest size to accommodate you. In other words, if we'd have ordered the Waterfield case to fit the iPad2 + Smart Cover, but decided not to use the Apple Smart Cover, the sleeve case would be just a touch too large. 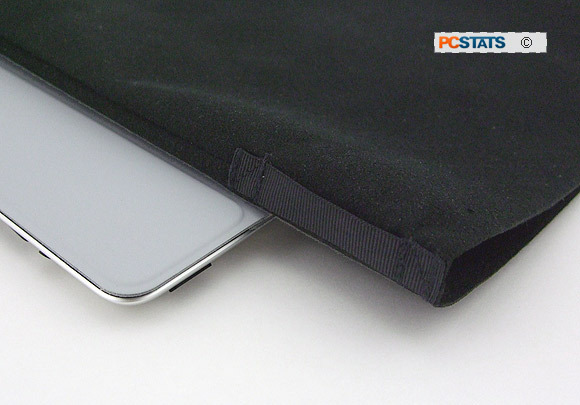 We picked the sleeve case made for the iPad2+Smart Cover - it fits like a glove. For those that need to know, the synthetic Ultrasuede material is a little over 1/32" thick. 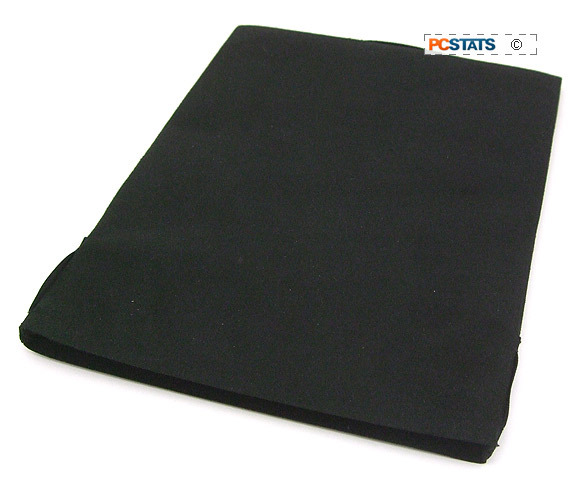 The sleeve contains no padding, it simply offers abrasion protection. Altogether the Suede Jacket sleeve case, iPad2 + Smart Cover assembly measures ~0.5" thick, so the sleeve case adds ~1/16" to the overall thickness. I'm not sure what the water repellant qualities of Ultrasuede are, but after spilling a bit of water on the case it seemed to be somewhat hydrophobic (water resistant). Waterfields's iPad Suede Jacket is made in San Francisco and retails for $19 (with pocket: $25) via SFbags.com. The company was started started 13 years ago by Gary Waterfield, a former bicycle courier. The Waterfield iPad Suede Jacket sleeve case was chosen specifically to protect this iPad2 and its laser engraved aluminum back from scuff marks. There are many Apple case products on the market these days, but for our requirements the Waterfield Suede Jacket sleeve case is just the right mix of cost ($19), abrasion protection and sophisticated simplicity. Best of all, I know their gear is well constructed and holds up. Recommended for anyone who totes their iPad along in an existing laptop bag or laptop-partioned knapsack.